, a celebrated French mathematician, member of the academies of sciences and the marine, and examiner of the guards of the marine and of the scholars of artillery, was born at Nemours the 31st of March 1730. In the course of his studies he met with some books of geometry, which gave him a taste for that science; and the Eloges of Fontenelle, which shewed him the honours attendant on talents and the love of the sciences. His father in vain opposed the strong attachment of young Bezout to the mathematical sciences. April 8, 1758, he was named adjoint-mechanician in the French academy of sciences, having before that sent them two ingenious memoirs on the integral calculus, and given other proofs of his proficiency in the sciences. 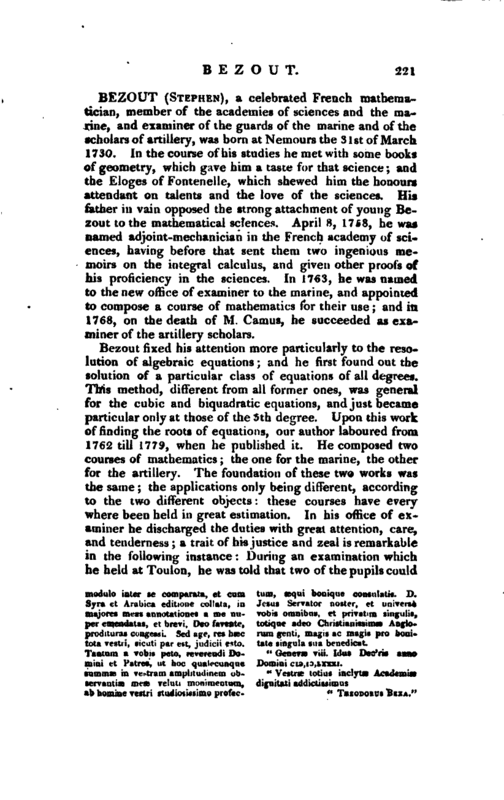 In 1763, he was named to the new office of examiner to the marine, and appointed to compose a course of mathematics for their use; and in 1768, on the death of M. Camus, he succeeded as examiner of the artillery scholars. Bezout fixed his attention more particularly to the resolution of algebraic equations; and he first found out the solution of a particular class of equations of all degrees. This method, different from all former ones, was general for the cubic and biquadratic equations, and just became particular only at those of the 5th degree. 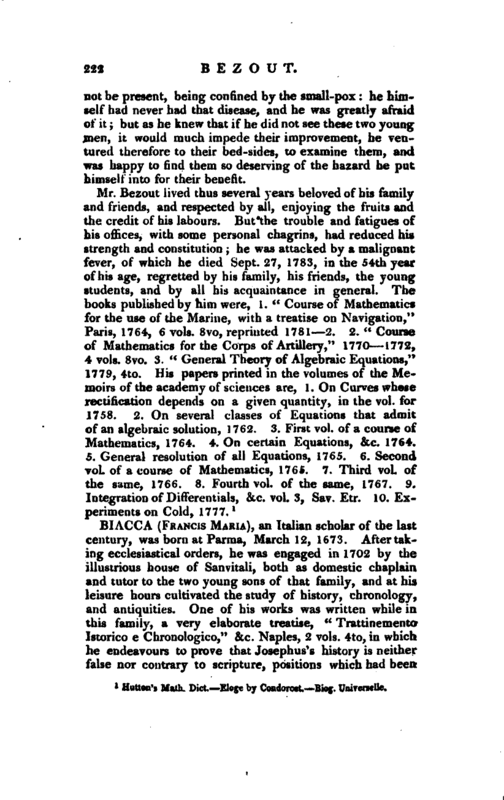 Upon this work of finding the roots of equations, our author laboured from 1762 till 1779, when he published it. He composed two courses of mathematics; the one for the marine, the other for the artillery. The foundation of these two works was the same; the applications only being different, according to the two different objects: these courses have every where been held in great estimation. In his office of examiner he discharged the duties with great attention, care, and tenderness; a trait of his justice and zeal is remarkable in the following instance: During an examination which he held at Toulon, he was told that two of the pupils could | not be present, being confined by the small-pox: he himself had never had that disease, and he was greatly afraid of it; but as he knew that if he did not see these two young men, it would much impede their improvement, he ventured therefore to their bed-sides, to examine them, and was happy to find them so deserving of the hazard he put himself into for their benefit. 1 Hutton’s Math. Dict.—Eloge by Condorost.—Biog. Universelle.